Condition is Used. The plastic light saber is slightly bent (see photos). It swivels. It is 7" tall with a 4" wide base. Trending at C $46.64eBay determines this price through a machine-learned model of the product's sale prices within the last 90 days. 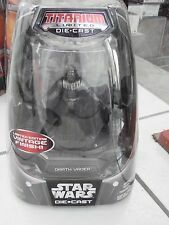 Star Wars The Power of the Force Darth Vader figurine for sale. Brand new, still in original package. Great condition. Includes glowing Lightsaber and remote dueling action. Electronic lightsaber really glows! 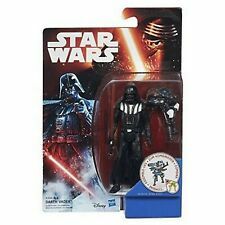 Star Wars The Force Awakens Rebels Darth Vader & Ahsoka Tano Figure 2-Pack New! 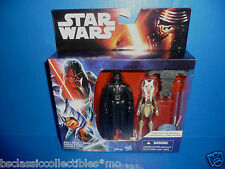 5 out of 5 stars - Star Wars The Force Awakens Rebels Darth Vader & Ahsoka Tano Figure 2-Pack New! 31 product ratings31 product ratings - Star Wars The Force Awakens Rebels Darth Vader & Ahsoka Tano Figure 2-Pack New! 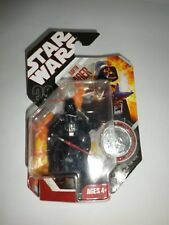 Star Wars Unleashed Darth Vader Figurine Depicting the iconic "I am your father" scene from The Empire Strikes Back Sealed in box Box shows only minimal wear Will be sent by Royal Mail Tracked 48 - We are always happy to combine shipping fees on multiple purchases Shipping fee quoted is for UK delivery only. We are willing to ship overseas but ebay handle that and dictate the shipping fees, we just send it to them and they do the rest... Thanks you for looking!!! A Set Of Three STAR WARS 12’’ Standing Figurines- Darth Vader, Shadow Stormtrooper and Anakin Skywalker. Made by Hasbro. All in a good used condition with some very slight minor usage marks. Anakin’s lightsaber is no longer attached. Reference: B3966. Numéro de pièce fabricant B3966. Héros Star Wars. height: 10.5 cm. Condition: new in box sealed. THE BOTTOM OF THE SHOE IS STAMPED 1997 HASBRO. THIS ITEM IS IN EXCELLENT CONDITION. MASK & CAPE ARE NOT INCLUDED.